Good morning, readers! On May 15th, KBShimmer is releasing a three part collection for Summer 2015! I have a few polishes from each of the three parts to share with you today. Let’s take a look at these gorgeous faded brights, flakes, and shimmer/glitters below. Part 1 of the Summer 2015 Collection consists of Tropical Creams and Toppers. Let’s look at the three I picked! This color leans a tad more pink than my camera wants to show, and its gorgeous! I love it! A near neon deep peach cream. Neons can have tricky formulas and this one did need that third coat to level everything out. The color payoff is definitely worth it to me! As with Bahama Drama, this color needed the third coat to even out the neon formula. Part 2 of the Summer 2015 Collection is full of Tropical Glitters! As you know, I’m not a huge fan of crelly glitters. I was happy to see a shimmer and a holo in with the rest of these glitters for me to choose from. I will say, though, that KBShimmer really knows how to do crelly glitters and I am very happy with the one I picked. A violet leaning pink crelly polish with holographic glitters in lime green, light blue, and pink. The glitters were nicely suspended and you are seeing 3 normal coats without dabbing or glitter placement. A bright magenta polish with blue shimmer and micro holographic sparkle. There are some lighter patches depending on the angle you turn your hands to the light so a third coat may be needed for complete and even coverage. I really like this color, but the shimmer is overpowering my photos. A deeper toned periwinkle linear holo with indigo blue shimmer. There is slight visible nail line at 2 coats so a third is up to you. 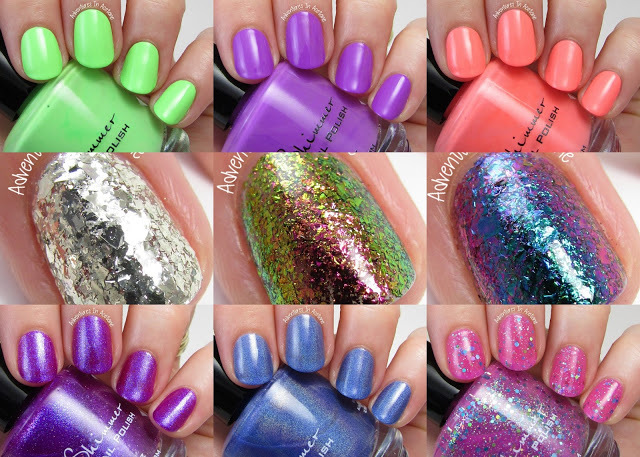 I am so sad it was storming the whole week I did these swatches so I don’t have the best holo photo for you. I really like the shimmer in this as well. The shimmer is hiding but you can kind of see it right next to the shine mark. It is more apparent in person and a beautiful addition to a holo. Part three of the Summer 2015 Collection is Ultra Chrome and Metallic Flakes. I am really excited about this part of the collection because I didn’t have any like these at home and they are SO FUN! The largest of the silver flakes. This can be worn alone or over a base color. First, I am showing you what three coats alone with top coat look like. I also have photos showing what one coat looks like over Sarong Place, Sarong Time below. The bigger flakes are so fun and I really like the effect. I didn’t have any problems with these flakes and this was normal application without dabbing or placement. This shifting shade goes from a rich green, to a violet purple, with hints of royal blue. I’m showing three coats with top coat below as well as some pictures of it as one coat over For Sail By Owner. These shifting flakes are GORGEOUS and I am so happy to have them. Get ready for a ton of photos below. This is the most vibrant shift out of the flakes. It travels from fuchsia to lime green, with shades of gold and copper in between. I’m showing three coats below with top coat as well as some pictures of one coat over Bahama Drama. The color shift is incredible with this one! You may remember I used it in a chevron mani a little while back. There you have them! What do you think of my picks from the KBShimmer Summer 2015 Collection? I am really enjoying each and every one of these and know there is something for everyone in this collection. These will be available on May 15th at KBShimmer.com, Amazon.com, and select salons and retailers. For sales outside of the US, they can be purchased at harlowandco.org. Thank you so much for reading! Let me know your picks below! Thank you for letting me know! I’ll look into it and see if there is anything I can do!